While US$200 million was spent gutting the interior, the building’s iconic exterior remains largely untouched. 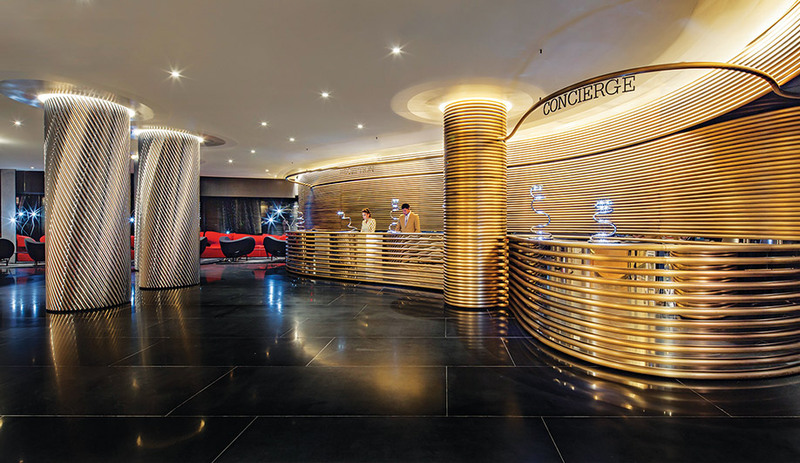 The reception and concierge desks are clad in stacks of brass-finished tubes manufactured and installed by Italian craftspeople. 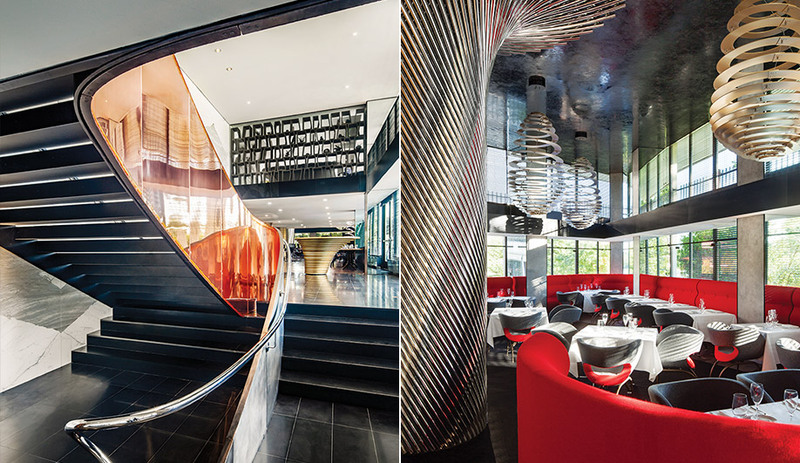 Left: Although the hotel was entirely gutted, Arad kept many of the lobby’s original curves, including a winding stair that leads to the main dining room. Right: Double-height windows give the 140-seat Kingbird restaurant views of the park in the complex’s core. Arad designed the banquette seats, and furnished the space with chairs designed exclu- sively for the Watergate. 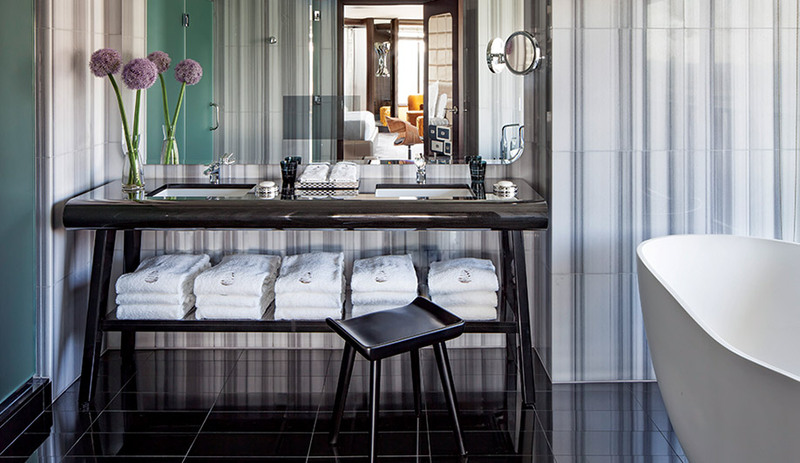 The bathroom walls are clad in Zebrano marble, and the granite vanities are custom built. 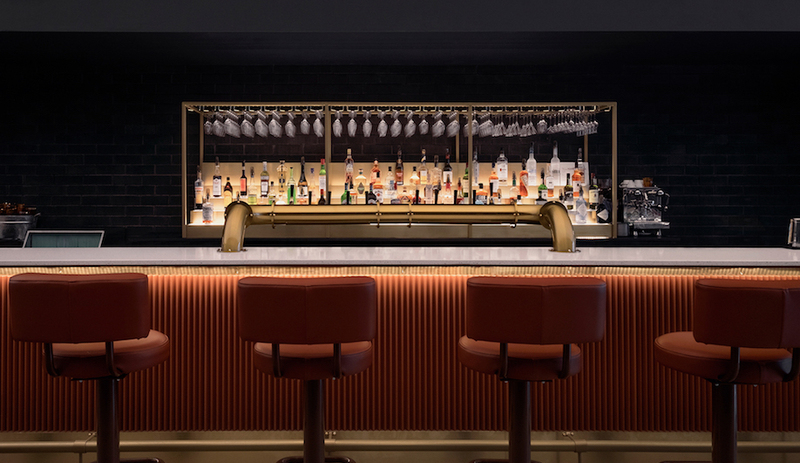 A major renovation of the Watergate Hotel has brought the legendary Washington address back to its former glory. It’s hard to believe the Watergate Hotel was close to demolition not long ago. For a luxury hotel, it has everything going for it: panoramic views, a downtown location in a destination city, and a history that counts movie stars, heads of state and royalty among its regular guests. Of course, there is also the unforgettable role it played in bringing down the 37th president of the United States, after it was discovered that Richard Nixon’s administration had burglarized and tapped the phones of the Democratic National Committee office in that very complex. Yet beginning in the 1990s, the hotel lost its mojo, and by the start of the 2008 financial crisis, it had slid into receivership, standing vacant and seemingly destined for the wrecking ball. Part of a five-building, multi-use development planned by Italian architect Luigi Moretti, it remains an anomaly and, as one of only a few 1960s modernist buildings, stands apart from the neoclassicism that defines so much of Washington, D.C. Moretti built the complex as a cluster of curved mid-rises around two fountain-filled parks, with bending walls that capitalize on sightlines to the Potomac River. The hotel’s salvation came in the form of Euro Capital Properties, a New York real estate company run by Jacques and Rakel Cohen. 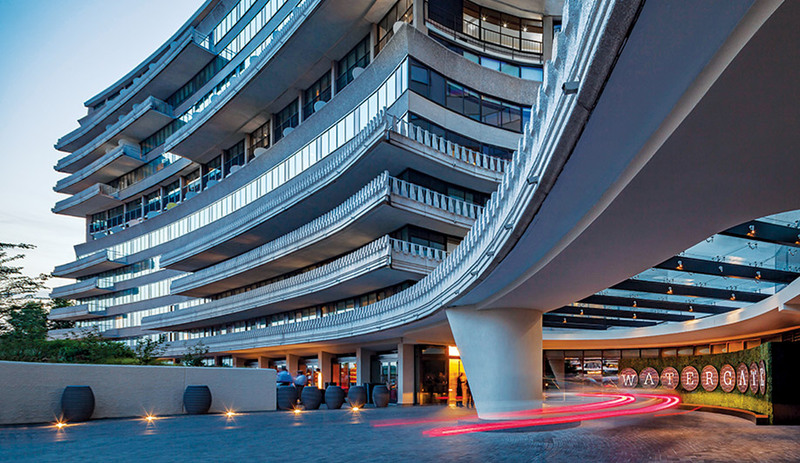 The pair bought the Watergate for US$45 million as their first investment property, aiming to restore it to the glory of its heyday. They poured another US$200 million into gutting and rebuilding it, and recruiting London-based Israeli designer Ron Arad to lead the job. Arad didn’t hesitate to take it on. 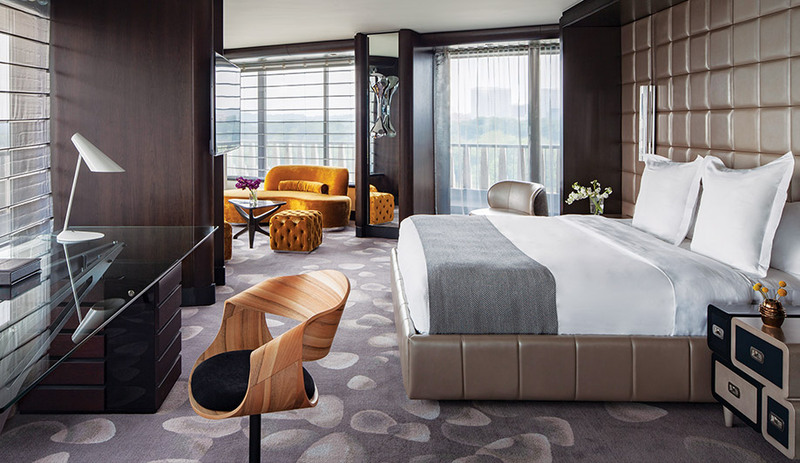 Two presidential suites play up the hotel’s 1960s heritage. Sinu desk chair by Eclectic Contract, and sofas by Roche Bobois. Open since June 2016, the remade Watergate is astounding. It has kept the appeal of a bygone era without falling into the temptations of cliché. 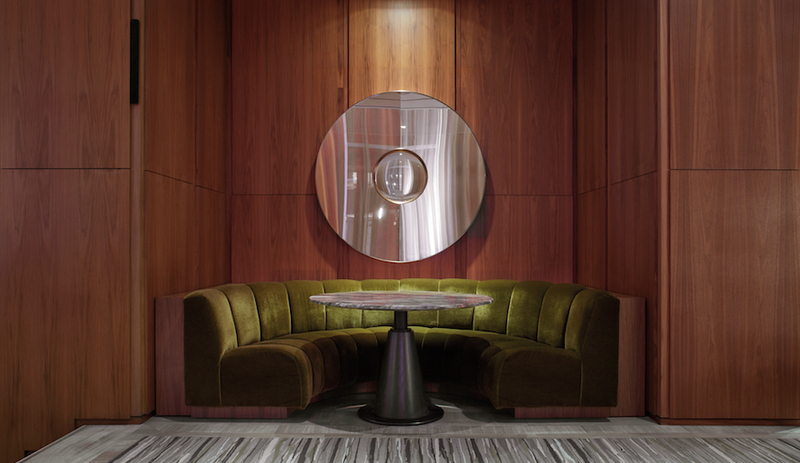 References to the Nixon scandal, for instance, are minimal, such as the pencils, which say in gold letters, “I stole this from the Watergate Hotel.” Almost everywhere else, Arad has channelled Moretti’s modernist sensibilities by accentuating curves, playing up rich surfacing materials and filling rooms with statement-making furniture. In the lobby, for instance, a floor of black granite sets off a reception desk and interior columns wrapped in stacked layers of brass-coated metal tubes. Another curvilinear wall is clad in similarly horizontal slats of white Austrian oak. The palette is brass and silver, black and red – the same swatch selection that makes up the staff uniforms, designed by Mad Men costumer Janie Bryant. 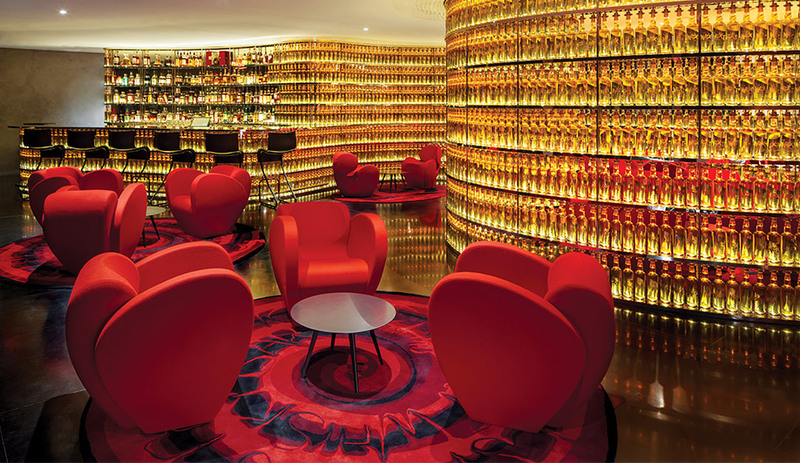 In the Next Whisky Bar, a wraparound wall made of illuminated whisky bottles is complemented by Size Ten loungers – both are designed by Ron Arad, as are the custom rugs manufactured by Nanimarquina. For the lobby’s Next Whisky Bar, Arad designed a spiralling wall out of 2,500 whisky bottles, each lit from below and mounted to a discreet metal framework. 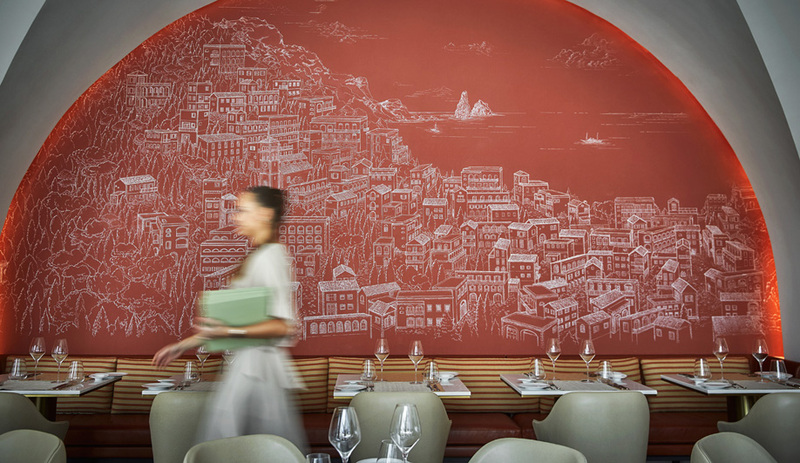 The wall’s swirling conch-like shape leads guests from an open bar – which specializes in spirits from small-batch distilleries – into an intimate room with a half-dozen of Arad’s Size Ten lounge chairs upholstered in bright red. It’s fun and gaudy at the same time, and the bottles give off a golden radiance that makes everyone’s complexion simply glow. 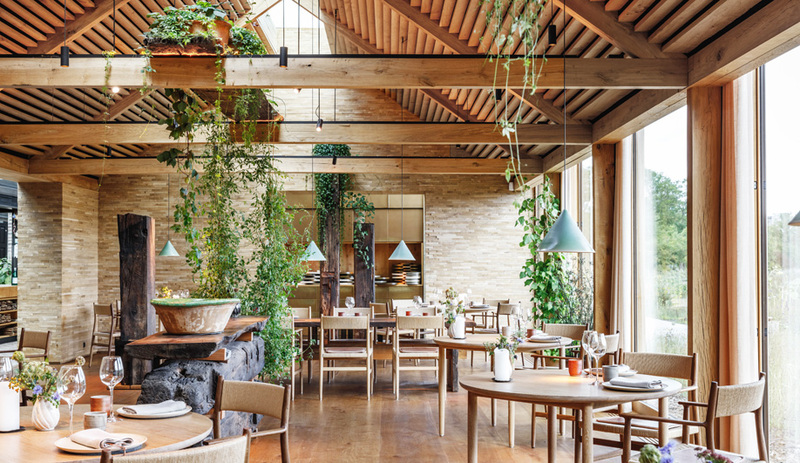 Arad kitted out the more formal Kingbird restaurant using his curvy One Skin bar stools and chairs as a main feature, and by wrapping two giant structural columns in chrome tubes that spread out across the ceiling like tree branches. To give the 336 guest rooms a complementary look, local firm BBGM tapped Moretti’s style by choosing soft-cornered furniture, and lining the bathroom walls with striated Zebrano marble. Already, the hotel has caught on with locals who, from 6 p.m. on, make a beeline to the Top of the Gate. In summer, Elevator C is reserved during cocktail hour exclusively for moving small groups to this 15th-floor rooftop bar, whose uninterrupted views of the city and Potomac River have made it a hot ticket. From this vantage point, it’s clear the Watergate Hotel is, once again, the best place in town to be seen and heard.